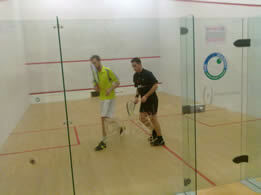 This was the last event in the 2010 Harrow UK-Racketball Series and it turned out to be a great one. Congratulations to Ted Jeal who claimed his first Harrow UK-Racketball Tour Title at Hunts County. Check out all the results, photos and match reports below! Click below for some great pictures from our sponsor Harrow and all the other photos of the day. Some great matches but in the end the number 1 seed comes through almost unscathed. 3 weeks ago Galen had claimed his first racketball trophy at the St Ivo Tournament but was facing a tough field if he wanted to claim his first UK-Racketball Tour Title at his home club. Even his first match was a tough one, Galen made a rusty start and soon found himself 10-5 down in the first with Richard playing controlled racketball and waiting for the errors. From 10-5 down though Galen came back hitting the ball harder and beginning to find length, he ended up taking the game 12-10 and didn’t look back taking the 2nd comfortably. Galens next opponent Pete Gooding’s (up to 17 on the UK-Racketball Rankings) would be a tough opponent and as always with Gooding’s it doesn’t seem to matter who he is playing it’s his shots that seem to determine the result. When he’s on he can rattle off winner after winner when he’s not all you can hear is the sound of the ball hitting the tin, usually very hard! In the first Galen looked to be playing himself in after his close opener that morning but in the end Gooding’s just made too many mistakes costing him the game 11/6. In the 2nd Gooding began to find his range and started to crack some great winners, there was little Galen could have done and the match was back level. In the 3rd Gooding’s hit some great winners but in the end there were just too many mistakes and Galen finished off the match keeping his title hopes alive. In the final game in the group Richard managed to overcome Gooding’s 2-1 who was looking tired after a couple of over 40s matches (my fault, sorry Pete!). It’s always interesting to see how new participants to the UK-Racketball series approach the best of 3 format where you really cant afford to give your opponent anything especially early on. Both started solidly not going for much and fighting for the early lead which never came, it was a classic case of both players negating the other and failing to gain any advantage. Right through to the tie break neither player managed to pull away with both hitting hard lengths and retrieving well. Stablers could have taken the 1st game having 3 game balls but in the end Jeal claimed a brutal game 16/14. After winning the first you can often keep the momentum going into the 2nd and Jeal did just that racing to a 7-2 lead, Stablers fought back but it was to late, fantastic racketball played in a great spirit. 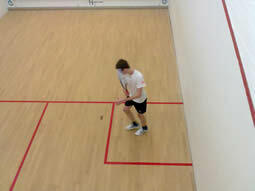 2-0 was a flattering score line but Jeal will take it, first win on the UK-Racketball tour. Stabler lost another 1st game on tie break this time 12/10 despite going 8-4 up, Powley fought back well and with the momentum in his favour just managed to hang on and take the opening tie break. Unlike against Jeal however Stabler made a strong start to the 2nd taking an early lead and never looking back taking the last 2 games 11/7, 11/6. A very high standard of racketball but Richards never really managed to bring Stablers out of his comfort zone. Stablers always looked that bit more controlled hitting good length and working Richard out of position with controlled working straight attacks to the front. Both games were comfortable with Stablers playing progressively better racketball as the day went on, would have been interesting to see him have another crack at Jeal. Sometimes the 3rd, 4th playoffs aren’t competitive, this was with Richard fighting right to the end to find a way back in. With the results from the A grade coming in faster than the 50’s or B (which had bigger draws) the players had a couple of hours to prepare for the final, something that doesn’t often happen on the quick fire UK-Racketball Tour. Both players had tough group games leading to the final but hopefully they would be recovered. Another fantastic UK-Racketball Tour final with both players lifting their games to a new level from what we had seen from them so far in the day. Both hit the ball hard, both have winning shots and both are used to winning racketball events, always going to be close contest. In the end Jeal was just more mobile getting a few more balls back, with desperate retrieves off the back wall and racing from corner to corner. Some rallies he retrieved what would have been 3 winners against another opponent. Galen will be a handful for whoever he gets in the nationals, my tip for an age group title! Would be great next season to have tour finals with Dom Hamilton playing off against Ted Jeal, Andrew Birks, Eddie Chalton, Laura Hill, Gavin Perrett, Sam Stablers, Tom Phipps, Neil Chambers and Matt Baker to name only a few. Would be some tournament. There would be a lot of matches in group B with many of the competitors leaving having had at least 4 and in many cases 5. The standard was also one of the highest in a B grade so far. Tom Murton the victor of Wolverhampton 3 weeks earlier came through the group stages unscathed with Rob Allen narrowly beating Gary Slator to claim 2nd place. Brodrick started slowly with Herron taking the ball early and dictating the pace of the first game. Brodrick came back at the start of the 2nd with some tough rallies but once Herron pulled away the match was all over. Both guys were leading the 4 man group with this match deciding a place in the semi final. The first game was played at a fast pace and went right to tie break with Herron just holding on 12/10. The second was always going to be a battle and was close right through until Herron pulled away 10/7 to set himself up with 3 match balls. Proudfoot dug in and stopped making mistakes and Herron tried to go for a few to finish the match but missed with Proudfoot fighting back to take the game to a tie break. A brutal rally at 10-10 was won by Proudfoot who then converted his first game ball to level the match at 1-1 but the momentum was anything but even. After getting so close to winning the match in the 2nd it was always going to be tough for Heron to re group for the 3rd and he never quite managed it, losing the game 11/4 and the match 2-1. Stephen Elliott set up his rematch (of the Wolverhampton final) with Tom Murton in the semis, without dropping a single game in group C but Antony Ryder came close. James Murphy (Mr consistent on the UK-RB tour) reached his 3rd semi final out of 4 on the tour so far winning both matches 2-0. 3 of the 4 semi finalists had achance to top the B rankings for 2010 if they came through with the win so there was everything to play for. With Gary Culverwell absent he was guaranteed to lose the top spot but it could still be either Tom Murton (3rd place 350pts), James Murphy (5th place 335pts) and Stephan Elliott (10th place with 230pts) who would become series champion. These two played in the closest final of the tour so far with both having tournament balls and Murton eventually coming out on top 15/13 in the 3rd set tie break. The match today was almost as close and Elliott must be gutted to once again finish on the receiving end, so close but another great battle. Stephan Elliott bt James Murphy 2-0. Murphy had just played the 50s final and had been on court for 7 matches already that day, another good effort. Both players had a tough root to the final, both had already had 3 matches of which they had sneaked one 2-1 but Proudfoot had the longer break of the 2 ahead of the final. The first game was tight but Proudfoot was hitting a better length and Murton doing more work. Murton was looking tired before he started and this relentless pressure was beginning to take its toll, he wasn’t moving on to the ball as quickly and trying to finish rallies to early. In the end Proudfoot came through a comfortable winner, bet he’s feeling glad he didn’t lose one of those match balls against Herron earlier. Harrow T3 racket for the winner, great effort Ross. But congratulations to Murton as well who has topped the B rankings for 2010! Check out the rankings that will be on the site soon! No Rob Watkins today (car trouble) so the draw was wide open and in one big group it would be a straight shootout for the title. This was a rematch of the opening match in Esporta (the 2nd tournament) in the UK-Racketball tour where Patrick had emerged victorious 2-1 and scarpered Buzby’s hopes of a title on home turf. This time Buzby was ready though and right from the start the match was a battle at 8/8 in the 1st both players were looking for anything that would give them the edge and Buzby found it with a fortunate stroke, after that Patrick never recovered his composure losing the game 11/8. In the second Buzby kept the momentum of the first going racing to a 7/3 lead only to see Patrick fight back before Buzby had just enough left to hang on and finish the match. A fantastic match which Mark came out of on top 2-1. Pete had just finished his first round in A against Galen and looked at times to have nothing left, his racket skills all that was keeping him in the game. Despite a last minute stand in the 3rd coming back from 10/4 down to 9/10 he just didn’t have enough in the tank and finished cursing the organiser who had him in 2 events (sorry again Pete!). Regular sparing partners who both still stood a chance of the title was always going to make for an interesting game. 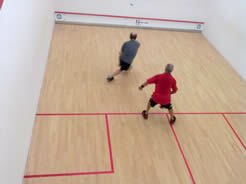 Mark played steady racketball from the off, hitting deep and keeping the ball hard and low. In the second Patrick came back finding better length and slotting winners with a great forehand drop and boast. In practice I am told Patrick always comes out on top but it wasn’t the case today, in the 3rd Mark was just to steady and claimed the contest. The first game was close all the way and eventually fell to Buzby 11/9. In the second Mark was the quicker starter and quickly found himself 7/3 up, it looked like the match was heading for a 3rd set but Buzby dug deep and stopped going for anything risky and just made it tough and waited for the error. They eventually came and Buzby had the win, his first title and the points will surely see him finish near the top of the 40s rankings. Quite a few late withdrawals left the 50s draw looking considerably smaller than anticipated. In group A Mike Philips once more came through triumphant with Graham Greensall overcoming tour new comer Peter Dampney to claim 2nd place. In group B and C it was the tour veterans against the tour newcomers and the veterans came out on top with James Murphy beating Gary Mason and Garry Devonish beating Byron Williams. Graham Greensall came out on top not dropping a game, with Gary Mason coming out on top against Byron Williams to claim 2nd place. Good match between Devonish and Murphy but there was always only going to be one winner with Mike Philips completing the set with his 5th title and still not really looking troubled. If anyone needs a racket I’m sure Mike Philips will share, that’s his 5th Harrow T3 from the series, he will take some catching at racketball. James Murphy has been unlucky though, this was his third 50s final on the tour so far and without Mike Philips he surely would have claimed a title (and racket). To have reached 3 B semis and 3 50s finals is a great effort; if he maintains that consistency for 2011 he must surely take his first title soon. Some really great age group racketball in Hunts County all played in a fantastic spirit. 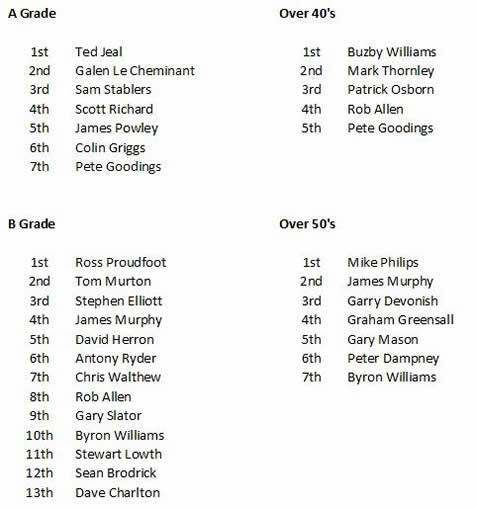 We will have to look at exactly what we will do with the age group categories in the 2011 tour, join the debate on the www.uk-racketball.comforum to have your say, which ball should we be using, should there be an over 45’s/ over 60s? We want to run tournaments that you want to play in so please let us know if there is anything you think we should change and we will try and get it right. As the tournament is played all in one day we are planning for a 9 AM start (although this could be 9:30 or 10:30 depending on entries) and that the finals will be around 7:00pm in the evening. We guarantee every competitor will have at least 3 matches. 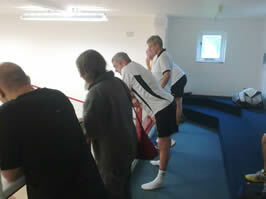 Hunts County Squash Club (HCSC) was founded in 1967, and is one of the most active squash clubs in Cambridgeshire. 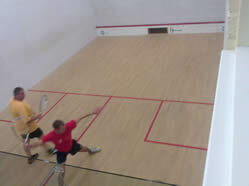 A fourth exhibition squash court was added in April 2006, the first to be built in Cambridgeshire for a number of years. With a seating capacity in excess of 125 spectators, front and rear wall video facilities for both coaching and recording of major events and under floor heaters for controlled heating, the court has already been approved by England Squash as a venue to hold national training days and open tournaments, and is now home for the British U23 Squash Championships.